Take a leap of faith and give BASE jumping a try! In recent years, thanks in no small part to thrilling YouTube videos and increasing mainstream media coverage, BASE jumping has gone from a fringe sport to a full-blown phenomenon. But what exactly does this activity entail and what do you need to know before you give it a go? Read on to find out. In its purest form, BASE jumping involves highly trained extreme athletes who climb to great heights on manmade structures or tall cliff faces. Unlike skydiving, BASE jumpers don't use an aircraft of any kind, but instead choose to leap from the top of a fixed structures. But the two sports are similar in the fact that both use a parachute to arrest their fall and gently deliver them back to the ground. BASE is actually an acronym for the four types of fixed objects that jumpers can potentially leap from while taking part in the sport. These objects include buildings, antennas, spans (which often refers to bridges), and the Earth itself. That includes high cliffs, mountain tops, or other tall natural locations. BASE jumpers wear a parachute, and sometimes a wingsuit, which are specially designed outfit that allows them to slow their rate of descent while making precision aerial maneuvers on the way down. After leaping off a cliff, the jumper's wingsuit rapidly fills with air, so he or she can glide along like bird. Eventually they reach an altitude where it becomes critical to open their parachute instead, which is the safety mechanism that lowers them safely back to Earth. BASE jumping can be a very dangerous sport and there have been numerous fatal accidents over the years. Readers are encouraged to train with a certified skydiving instructor and spend many hours honing their skills before attempting a jump on their own. While trained professionals can make these descents look easy and routine, there are many subtle nuances and techniques that are only gained over time and following many successful jumps. Unlike skydiving, which typically takes place at higher altitudes, BASE jumping usually occurs closer to the ground and often in proximity with structures. This gives athletes less time to react to shifting conditions, equipment failure, or recover from a bad jump. This can sometimes result in serious injury or even death. That said, as the sport has evolved, some skydivers have turned to BASE jumping to get a visceral rush of adrenaline on a regular basis, creating a great deal of crossover amongst the two activities. Some base jumpers leap off bridges, while others take off from buildings. Some extreme adventurers don "birdmen" or "flying squirrel" suits (AKA wingsuits) then jump off of high cliffs or manmade structures instead. Others will even leap out of a plane and glide along at higher altitudes before deploying their parachutes, although by the strictest definition that isn't usually considered BASE jumping. During the first few seconds of free fall the wingsuits fill with air, allowing the birdman to soar at up to 140 miles per hour, sometimes flying close to rock walls and towers (or even through caves) during their descent. The suits allow the "pilots" to pull off precision maneuvers, although those are best left to experienced BASE jumpers and wingsuiters who have years of experience and know exactly what they are doing. Once the flight is near its end, and the ground is rapidly approaching, BASE jumpers deploy their parachutes and slowly drift back to the ground. The visceral appeal to the sport comes from the fact that no aircraft is needed, participants can leap off of anything that is fairly tall, and they are in complete control of their own destiny throughout. BASE jumping can trace its origins back to the 1970s when adrenaline seekers were looking for new sports to push their skills to the limit. In 1978, filmmaker Carl Boenish Jr. actually coined the term, when he and his wife Jean, along with Phil Smith, and Phil Mayfield, made the first jump off of El Capitan in Yosemite National Park using ram-air parachutes to slow their descent. They made an impressive free fall from that iconic rock face, essentially creating a whole new sport in the process. In the early years of BASE jumping, participants in this wild and dangerous new activity mostly employed the same gear that skydivers used when jumping out of airplanes. But over time, the equipment was refined and redesigned to meet the specific needs of the jumpers. The parachutes, jumpsuits, helmets, and other gear all evolved, becoming more compact and lighter, turning into something that was far better suited for use in a more active sport. Since BASE jumpers often have to carry their equipment with them to the point where they make their leap, these refinements were welcomed by the early pioneers of the activity who often walked or climbed considerable distances before they jumped into the air. The parachutes also has to deploy and fill with air quickly, as the distance from the jump point to the ground wasn't always very high. In the mid-1990's, French skydiver and BASE jumper Patrick de Gayardon developed what would become the first modern wingsuit. He had hoped to use his designs to add more surface area to his body, allowing him to glide more easily through the air while adding maneuverability to his jumps as well. In the years that followed refinements were made to the initial design by a number of other skydivers, and the wingsuit concept went from a prototype used by just a few people to a full-fledged product that is commonly used – and sold – today. In 2003, the wingsuit made the leap from skydiving over to BASE jumping, giving rise to a technique known as proximity flying. In this activity, the BASE jumper still leaps from a structure of some sort but glides back down to Earth while flying close to the ground, just above trees, buildings, cliffs, or other obstacles. A parachute is still required to make a safe landing however, as a wingsuit doesn't provide enough deceleration to allow for a controlled touch down. 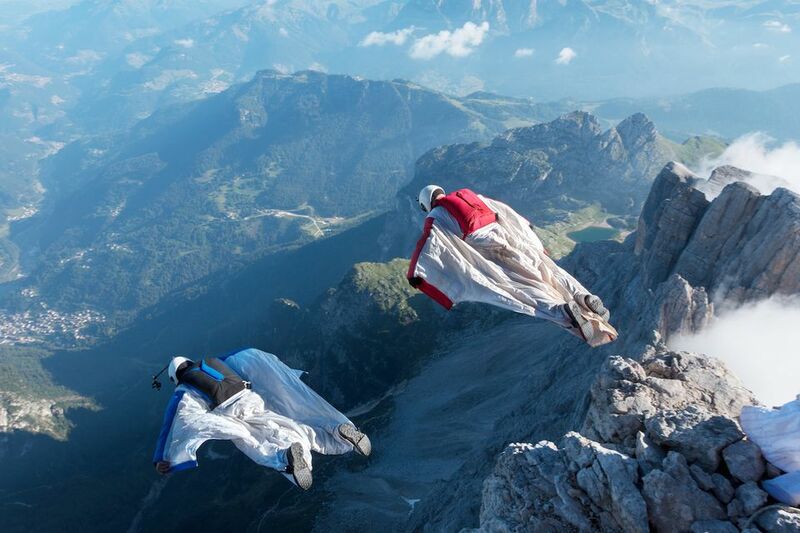 Today, wingsuit flying is considered an integral part of BASE jumping, with most participants choosing to wear the bat-like wingsuit while making their jumps. This has led to some incredible GoPro video footage of the pilots in action as they perform death-defying feats in scenic destinations all over the world. Norway's Troll Wall stands 3600-feet in height, making it the tallest vertical rock face in all of Europe. That also happens to make it one of the most enticing places to BASE jump as well. This location has been a popular one for decades, even though Norway has banned the sport. With excellent access to the summit of the mountain and a relatively clear take off and landing zones available below, the Troll Wall still lures plenty of BASE jumpers who are willing to take the risk. The drop-dead gorgeous scenery that is visible on the way down is a major bonus too. Spanning approximately 1500-feet across the Snake River in Idaho, Perrine Bridge is one of the top BASE jumping destinations in the entire U.S. It offers about 486 feet of elevation to drop from with some stunning scenery setting a dramatic backdrop. The bridge is the only place within the United States where BASE jumpers can take a leap without first requiring a permit, making it a popular destination for those who want to make a more spontaneous jump without having to cut through a lot of red tape. As the tallest waterfall in the world, Angel Falls is naturally also a popular destination for BASE jumpers. Just getting to the top can be quite an adventure in and of itself, requiring several days of hiking through the jungle and scaling the rock face to reach the launching point. But once there it is possible to take flight right alongside the falls themselves, plummeting some 3,212 feet in the process. Remote and beautiful, Angel Falls is a great place to practice the sport, which is completely legal throughout all of Venezuela. As you can probably imagine, the tallest buildings in the world are also common targets for BASE jumpers looking for a thrill. That makes the Burj Khalifa in Dubai one of the most coveted locations to jump in the entire world, both by parachute and wingsuit alike. Permission is required to make the leap from the top of the building, but those who do are treated to a 2700+ foot drop to the brightly lit wonderland of a city below. Just be sure to pick your landing zone appropriately. On the third Saturday in October of each year, the Bridge Day Festival takes place in Fayette County, West Virginia. During that celebration BASE jumpers are encouraged to leap from the 876-foot tall New River Gorge Bridge, which is one of the tallest vehicle bridges in the entire world. At other times of the year, jumps can be made too, but a permit is required ahead of time, requiring a bit of extra planning and paperwork. Still, BASE jumpers will make special trips just to add this impressive span to their resumes. If there is any building that has embraced its status as a BASE jumping icon, it is the Kuala Lumpur Tower in Malaysia. Rather than preventing BASE jumpers from sneaking onto the roof and taking flight, the tower actually encourages the activity. In fact, the KL Tower has been called the "BASE jumping center of the world" and hosts an annual event with more than 100 participants. Jumping can be done at other times too, but permission is again required. And while not quite as tall as the Burj Khalifa, the tower still provides a 1739-foot precipice to leap from, which is enough to get any extreme athlete's heart pumping. Beautiful and secluded, Navagio Beach on Zakynthos Island in Greece is definitely one of the most scenic destinations for making a BASE jump, even if it isn't one of the tallest. Daredevils begin their flight by first scaling the 656-foot rock walls that surround the beach itself. Once at the top, they can take to the air for a fast and wild ride back to the soft sands below, while the crystal clear waters of the Mediterranean lap at the shore nearby. Located in the Garhwal Himalaya in India, Meru Peak is the site of the highest BASE jump ever recorded. It is not an easy-to-access point for the average jumper, as it requires serious mountaineering skills – and several weeks of acclimatization – to reach, but the mountain's 21,850-foot summit is amongst the most extreme BASE jumping points on the entire planet. Meru is definitely not for the faint of heart, but is instead a top destination for the most experienced and adventurous of BASE jumpers on the planet. And while the summit may require a lot of work to reach, it is reportedly quite a jump. BASE jumping is an incredibly dangerous sport that should only be attempted by those who have been properly trained. It is estimated that an accident is 43 times more likely to occur while taking part in this activity as opposed to simply skydiving from an aircraft. According to Blincmagazine.com – a website dedicated to the sport – more than 350 people have died while BASE jumping since 1981. Anyone thinking about trying this activity for the first time should consult with certified and experienced jumpers and get proper training ahead of time.